, the Roman emperor, was born at Rome, April 26, in the year 121. When he was adopted by his grandfather by the father’s side, he received his name, M. Annius Verus; and Adrian the emperor, instead of Verus, used to call him Verissimus, on account of his rectitude and veracity. When he was adopted by Antoninus Pius, he assumed the name of M. ^lius Aurelius Verus, because Aurelius was the name of Antoninus’s family, and Ælius that of Adrian’s, into which he entered. When he became emperor, he left the name of Verus to Lucius Commodus, his adopted brother, and took that of Antoninus, under which he is generally known in history. But he is distinguished from his predecessor Titus Antoninus, either by the name of Marcus, or by the name of Philosophus, which is given him by the general consent of writers, although we do not find this title to have been conferred by any public act or authority of the senate. 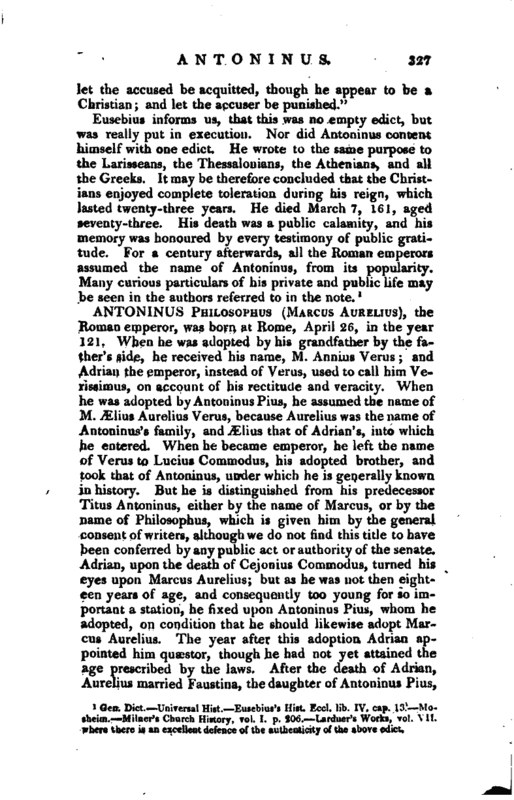 Adrian, upon the death of Cejonius Commodus, turned his eyes upon Marcus Aurelius; but as he was not then eighteen years of age, and consequently too young for so important a station, he fixed upon Antoninus Pius, whom he adopted, on condition that he should likewise adopt Marcus Aurelius. The year after this adoption Adrian appointed him quaestor, though he had not yet attained the age prescribed by the laws. After the death of Adrian, Aurelius married Faustina, the daughter of Antoninus Pius, | by whom he had several children. In the year 139 he was invested with newlionours by the emperor Pius, and behaved in such a manner as endeared him to that prince and the whole people. Upon the death of Pius, which happened in the year 161, he was obliged by the senate to take upon him the government, in the management of which he took Lucius Verus as his colleague. Dion Cassius says, that the reason of doing this was, that he might have leisure to pursue his studies, and on account of his ill state of health; Lucius being of a strong vigorous constitution, and consequently more fit for the fatigues of war. The same day he took upon him the name of Antoninus, which he gave likewise to Verus his colleague, and betrothed his daughter Lucilla to him. The two emperors went afterwards to the camp, where, after having performed the funeral rites of Pius, they pronounced each of them a panegyric to his memory. They discharged the government in a very amicable manner. But the happiness which the empire began to enjoy under the two brothers, was interrupted in the year 162, by a dreadful inundation of the river Tiber, which destroyed a prodigious number of cattle, and occasioned a famine at Rome. This calamity was followed by the Parthian war, and at the same time the Catti ravaged Germany and Rbsctia; and an insurrection was apprehended from the Britons, against whom Calphurnius Agricola was sent, and Aufidius Victorinus against the Catti. 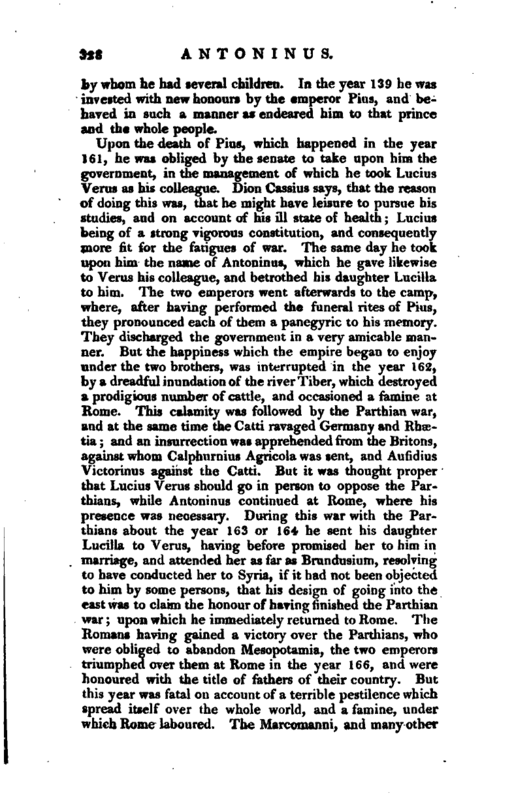 But it was thought proper that Lucius Verus should go in person to oppose the Parthians, while Antoninus continued at Rome, where his presence was necessary. During this war with the Parthians about the year 163 or 164 he sent his daughter Lucilla to Verus, having before promised her to him in marriage, and attended her as far as Brundusium, resolving to have conducted her to Syria, if it had not been objected to him by some persons, that his design of going into the east was to claim the honour of having finished the Parthian war; upon which he immediately returned to Rome. The Romans having gained a victory over the Parthians, who were obliged to abandon Mesopotamia, the two emperors triumphed over them at Rome in the year 166, and were honoured with the title of fathers of their country. But this year was fatal on account of a terrible pestilence which spread itself over the whole world, and a famine, under which Rome laboured. The Marcomanni, and many other | people of Germany, likewise took up arms against the Romans; but the two emperors having marched in person against them, obliged the Germans to sue for peace. The war, however, was renewed the year following, and the two emperors marched again in person; but Lucius Verus was seized with an apoplectic fit, and died at Altinum. The Pagans as well as Christians, according to M. Tillemont, p. 621, art. xvi. have acknowledged the truth of this prodigy, but have greatly differed as to the cause of such miraculous event, the former ascribing it, some to one magician, and sorneto another: In Antoninus’s Pillar, the glory is ascribed to Jupiter the god of rain and thunder. But the Christians affirmed, that God gi anted this favou: at the prayer of the Chnstian soldiers in the Roman army, who are said to have composed the twelfth, or the Melitene legion; and, as a mark of distinction, we are told that they received the title of the Thundering Legion from Antoninus. (Kuseb. Keel s. Hist. lib. v. cap. 5.) 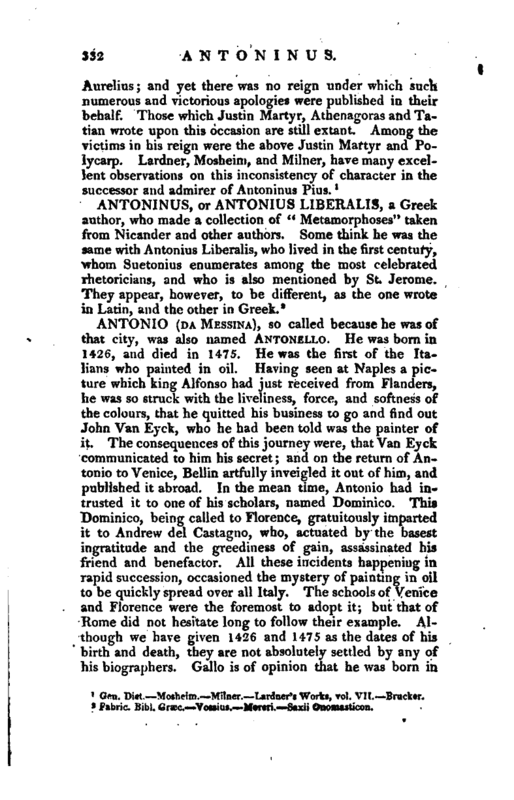 Mr. Moyle, in the second volume of his works, has endeavoured to explode this story of the Thundering Legion, which occasioned Mr Whiston to publish an auso n 1726, entitled, “Of the Thundering Legion;” or, Of the ridiculous Deliverance of Marcs Antoninus and his Army, upon the Prayers of the Christians. In the year 175 Antoninus made a treaty with several nations of Germany. 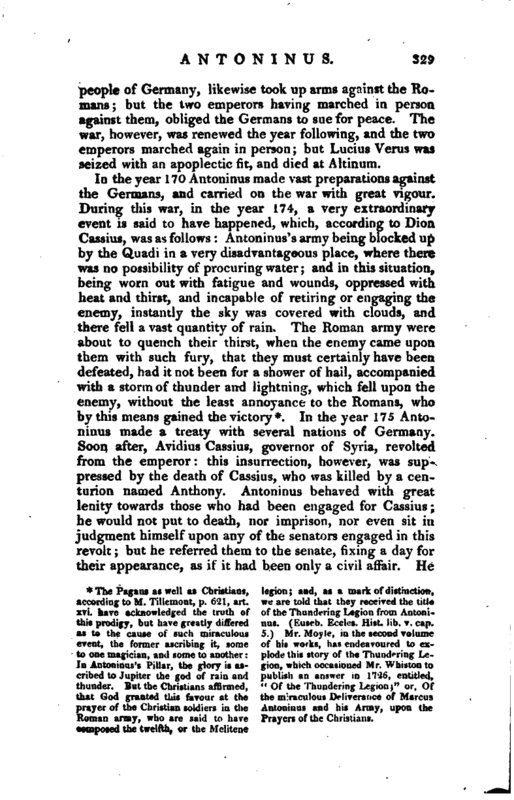 Soon after, Aviclius Cassius, governor of Syria, revolted from the emperor: this insurrection, however, was suppressed by the death of Cassius, who was killed by a centurion named Anthony. Antoninus behaved with great lenity towards those who had been engaged for Cassius; he would not put to death, nor imprison, nor even sit in judgment himself upon any of the senators engaged in this revolt; but he referred them to the senate, fixing a day for their appearance, as if it had been only a civil affair. He | wrote also to the senate, desiring them to act with indulgence rather than severity; not to shed the blood of any senator or noble, or of any other person whatsoever, but to allow this honour to his reign, that even under the misfortune of a rebellion, none had lost their lives, except in the first heat of the tumult: “And I wish,” said he, “that I could even recal to life many of those who have been killed; for revenge in a prince hardly ever pleases, since, even when just, it is considered too severe.” In the year 176 Antoninus visited Syria and Egypt; the kings of those countries, and ambassadors also from Parthia, came to visit him. He staid several days at Smyrna, and after he had settled the affairs of the east, went to Athens, on which city he conferred several honours, and appointed public professors there. From thence he returned to Rome with his son Commodus, whom he chose consul for the year following, though he was then but sixteen years of age, having obtained a dispensation for that purpose. On the 27th of Sept. the same year, he gave him the title of imperator; and on the 23d of Dec. he entered Rome in triumph, with Commodus, on account of the victories gained over the Germans. 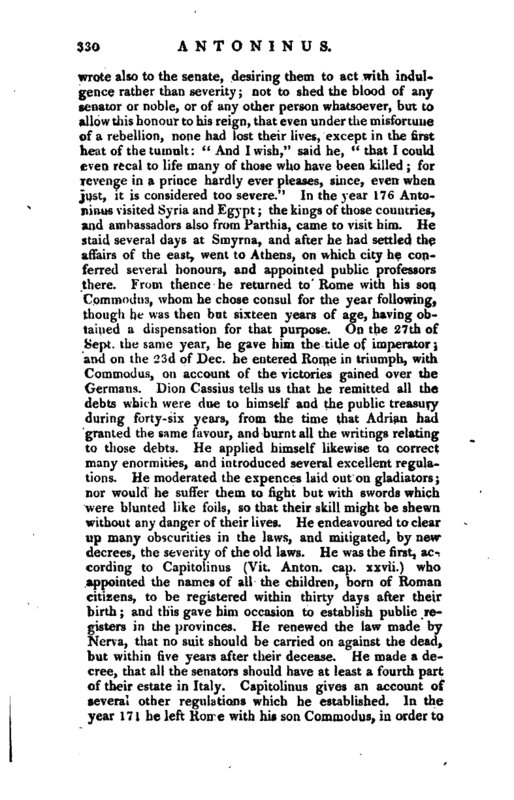 Dion Cassius tells us that he remitted all the debts which were due to himself and the public treasury during forty-six years, from the time that Adrian had granted the same favour, and burnt all the writings relating to those debts. He applied himself likewise to correct many enormities, and introduced several excellent regulations. He moderated the expences laid out on gladiators; nor would he suffer them to fight but with swords which were blunted like foils, so that their skill might be shewn without any danger of their lives. He endeavoured to clear up many obscurities in the laws, and mitigated, by new decrees, the severity of the old laws. He was the first, according to Capitolinus (Vit. Anton, cap. xxvii.) who appointed the names of all the children, born of Roman, citizens, to be registered within thirty days after their birth; and this gave him occasion to establish public registers in the provinces. He renewed the law made by Nerva, that no suit should be carried on against the dead, but within five years after their decease. He made a decree, that all the senators should have at least a fourth part of their estate in Italy. Capitolinus gives an account of several other regulations which he established. In the year 171 he left Rome with his son Commodus, in order to | go against the Marcomanni, and other barbarous nations; and the year following gained a considerable victory over them: he would, in all probability, have entirely subdued them in a very short time, had he not been taken with an. illness, which carried him off on the 17th of March 180, in the fifty-ninth year of his age, and nineteenth of his reign. The whole empire regretted the loss of so valuable a prince, and paid the greatest regard to his memory; he was ranked amongst the gods, and every person almost had a statue of him in their houses. His book of “Meditations” has been much admired. It is written in Greek, and consists of twelve books; there have been several editions of it in Greek and Latin, two of which were printed before the year 1635, when the learned Meric Casaubon, prebendary of Canterbury, published a second edition of his translation of this work into English, dedicated to Laud, archbishop of Canterbury. It was also translated, in a very inelegant style, by Jeremy Collier. 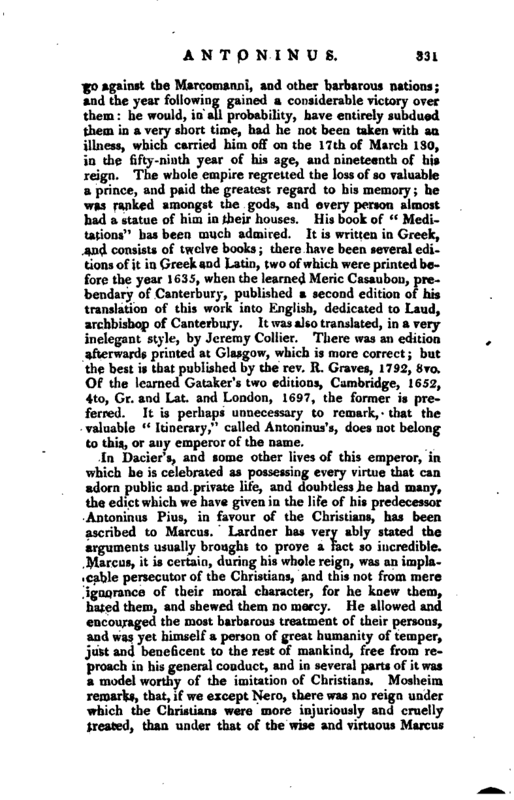 There was an edition afterwards printed at Glasgow, which is more correct; but the best is that published by the rev. R. Graves, 1792, 8vo. Of the learned Gataker’s two editions, Cambridge, 1652, 4to, Gr. and Lat. and London, 1697, the former is preferred. It is perhaps unnecessary to remark, that the valuable “Itinerary,” called Antoninus’s, does not belong to this, or any emperor of the name. Gen. Dict. Mosheim.--Milner. Lardner’s Works, vol. VII. Erucker.